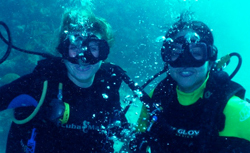 Excursions geared for certified scuba divers offer more aggressive dives into Costa Maya's waters to visit gardens of coral and schools of unique marine life. Great company, but bad weather that day. Great company, but bad weather that day. Visibility was terrible. The dive itself was very good! located right on the beach at Mahawahl it is convenient and inexpensive. located right on the beach at Mahawahl it is convenient and inexpensive. $60 for a 1 tank dive with equipment. Tell Oscar that Peter sent you. Interesting place as it is not a city.